The desirable outcomes of interpretation in a wildlife setting include the stimulation of visitor intent to minimise impacts and maximise support for the marine environment and its wildlife. Existing frameworks and models of wildlife tourism focus on interpretation and the cognitive domain. However, wildlife tourism encounters, especially with whales and dolphins, can be intense, emotional, powerful and profound affective experiences. Theory and models from experiential education were more relevant and applicable for exploring synergistic relationships between the affective and cognitive domains that resulted in changes in attitudes, beliefs, behaviours and actions. 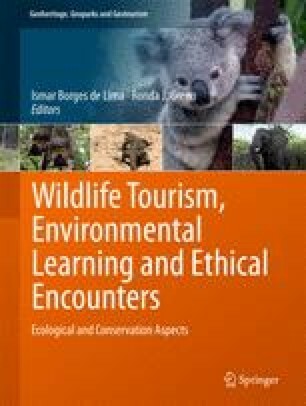 This paper investigates the interactive effects between the intensity of wild dolphin tourism experiences in the presence of education/interpretation commentaries on: overall satisfaction levels; changes in knowledge; and changes in pro-environmental attitudes, beliefs, intended behaviours and intended actions of participants. A multiple case study approach was used to collect data on six matched and paired dolphin tourism activities which varied in intensity and educational and interpretive input. Chi-square, one and two-way ANOVAs and MANOVA analyses (with a reduced number of factors) were used on data from 600 structured self-administered questionnaires. Results suggested that high intensity wild dolphin experiences are highly satisfying, and that the overall satisfaction of participants is not enhanced by the inclusion of a high quality interpretation component. High intensity wildlife experiences in themselves appear to have significant educative impact or power which can impede positive effects of high quality interpretation commentaries on increases of knowledge of participants and intended pro-environmental behaviour change. Minimal information in these intense instances appears to gain maximum impacts—so interpretive staff should let the oceans speak! However, as the intensity of wildlife experiences decrease, the quality and presence of interpretation in wild dolphin encounters play a greater part in enhancing overall satisfaction, knowledge of participants, pro-environmental attitudes and beliefs, and intended behaviours and actions. Therefore, as the intensity level of wild dolphin encounters decrease, guides need to deliver increasingly high quality commentaries as essential inputs of the tourist experience.